As the healthcare industry continues its march toward electronic data exchange, those in the profession will face many challenges. Perhaps more so than others in the HIM field, cancer registrars have grown accustomed to change, a characteristic that has helped prepare them for the journey ahead. To meet the demands of a new era in healthcare, cancer registrars must make education a priority, including researching and understanding how the EHR will be used to reshape workflow processes. To this end, it will be important to network with those who have already gone through the implementation process. To prepare for the transition, cancer registrars must seek out those in their facility who are responsible for EHR operations. Get involved, make sure the needs of the cancer registry are expressed, and explain how the move to an electronic system affects the department. Also, attend meetings to learn about the EHR process and identify a strong advocate to bolster your position. By communicating with other departments, cancer registrars may discover there is a more efficient way to obtain reports and other much-needed information. Other departments may not have realized the wealth of information available from the registry and may begin to make more data requests. Data use is important for the cancer registry to be seen as an integral part of the hospital. Ask the HIM director whether the hospital is part of a larger network—if so, identify the registrars within the facility’s group and begin a collaboration. Where do the registry abstracts and follow-up fit in the EHR? Without this input, these types of decisions could result in a negative impact on the registry. Push for an active role in the decision-making process when it comes to EHRs and how information will be shared. Seek the support of the Cancer Committee and make sure it is aware of the registry’s needs. This team is a great support network for the cancer registry. Use their expertise and advice when working with other departments. With the committee’s support, more can be accomplished in the effort to become fully electronic. Another ally that hospital registrars may forget about is their state cancer registry, which should be able to supply information on EHRs and their benefits to the profession. It also will be able to provide details on how the state cancer registry plans to become fully automated. In 2007, the Arkansas Central Cancer Registry (ACCR) required that all hospital cancer registry data submissions be made electronically through a Web-based system. The Web Plus system sends an e-mail to registrars submitting the data, informing them whether their submission was accepted or rejected based on edits found. This gives the hospital registrar confidence in knowing that the submission was received and the data quality was up to par. By going electronic, the ACCR opened communication lines between cancer registrars and hospital IT departments, leading to many state cancer registries becoming more electronic, thus making their facilities more aware of their EHR needs. Cancer registrars need to find help from other sources as well. For example, networking is a great way to share accomplishments and challenges. Find out what other cancer registrars are doing at their facilities to prepare for the EHR; only colleagues understand the challenges faced by those on the front lines. Lean on others for support and encouragement. A great way to network with other cancer registrars is to join the National Cancer Registrars Association (NCRA) and/or a state cancer registrars association. Many of these organizations feature discussion forums where questions, comments, and feedback can be posted in a friendly social media environment. It is up to registrars to make their voices heard and become educated about what can be done as the era of electronic data exchange moves forward. 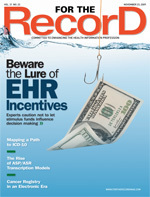 There are many ways in which registrars can educate themselves on the impact of EHRs. I recommend reading the NCRA’s Guidebook on Informatics, a helpful manual written especially for cancer registrars by those already well versed in the electronic data exchange movement. Industry magazines and the AHIMA Web site are other sources that can provide registry professionals with essential knowledge and the ability to stay abreast of the most current legislation and implementations. As cancer registrars, we are wonderful at adapting but sometimes do little in advance of the change. Now is the time for us to prepare for the future. We must educate ourselves and speak up for our registries. Let your voice be heard so the changes that come our way can be as positive as possible. Find others in your hospital working on the process of electronic data exchange and network with them and other cancer registrars. There is power in numbers. Don’t wait for others to bring the change to you. Put your ideas out there and let others know what you need. The power is inside of you, once you arm yourself with knowledge. — Melissa Riddle, RHIT, CTR, is the education/training coordinator for the Arkansas Central Cancer Registry.